Manila, Philippines (AP) — A passenger bus careened off a winding dirt road and hurtled down a ravine south of the Philippine capital, killing 19 people, police said Wednesday. 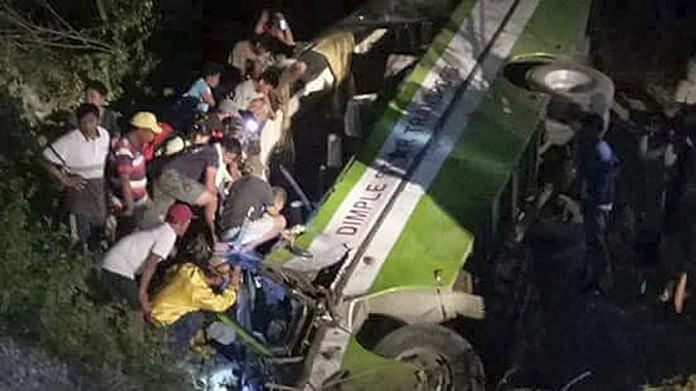 The crash Tuesday night in a mountainous area of Sablayan town in Occidental Mindoro province injured 21 other passengers, including an infant, police investigator Alexis Go said. He said the bus apparently went out of control and swerved wildly on a downhill stretch of the road, which was under repair. As it approached a bridge in the dark, “a surviving passenger recalled the driver yelling at them to hold on because the bus had lost its brakes,” Go said by telephone. “Then the passenger remembered everything tumbling around inside the bus, he heard a loud crash and he passed out,” Go said. The bus slammed into some stone barricades on the roadside ahead of the bridge and then flew off the road down a ravine, which was 15 to 20 meters (50 to 65 feet) deep. The impact killed the driver and most passengers in the front rows of seats, he said. An infant near the front survived after a relative embraced the baby and the seat cushion prevented him from being pinned to death, said Go, who inspected the accident site. Photographs showed the green and white Dimple Star Transport bus lying precariously on the edge of a dry canal at the bottom of the ravine. Rescuers peered into the bus cabin with flashlights attached to their foreheads. Investigators will try to determine if a brake failure or other mechanical problem caused the accident, Go said, adding there were no skid marks on the road where the bus plunged off the cliff. Highway fatalities are alarmingly high in the Philippines due to poor law enforcement, dilapidated vehicles and a lack of safety features such as signs and railings, especially in far-flung provinces. Sen. Grace Poe called for support for a Senate bill that would create a National Transportation Safety Board and other steps such as inspections of public transport vehicles and strict licensing of drivers. She said the crash was a reminder of how dangerous public transportation is in the Philippines. “Sadly, the list of tragic road accidents and their casualties continue to increase because vehicles that are not roadworthy or even those we label as rolling coffins are still allowed to ply the roads with near impunity,” she said in a statement.